Note: The Rhino Information provided here applies specifically to the white rhinoceros, which is more common and seen more frequently on safari than its counterpart, the rare and critically endangered black rhinoceros. 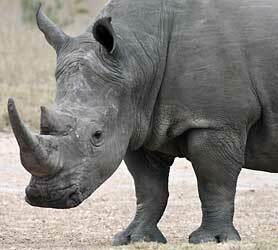 The white rhino, also known as the square-lipped rhino, is the second biggest land animal after the elephant. The name, "white rhino", has nothing to do with its color - its hide is in fact a gray color, although what you see is largely influenced by the color of the dust or mud in which it rolls. A large, distinctive hump can be seen on the neck, and the head is long and carried low. There are two horns on the face, of which the front horn is usually longer. The most distinctive feature of the white rhino, which immediately distinguishes it from the black rhino, is the broad, square lip which is well adapted for grazing grass, as opposed to browsing leaves and twigs. Behavior: The white rhino is much more sociable then the black rhino and white rhinos will sometimes form small herds of both sexes comprising two to five individuals. The social bonds within the group are not particularly strong, but if they are under attack, the herd will bunch close with their rumps together and face their horns outwards. The herd leader is the bull who marks his territory with urine and dung. The adult bulls are extremely territorial, and defend their areas aggressively. Territories are only left when water is not readily available. 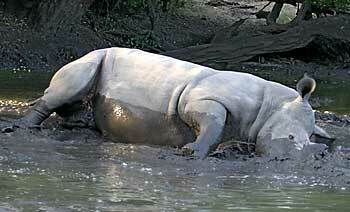 The white rhino is often found wallowing in water and mud to cool off and to get rid of parasites. Feeding takes place in the cooler mornings and late afternoons. 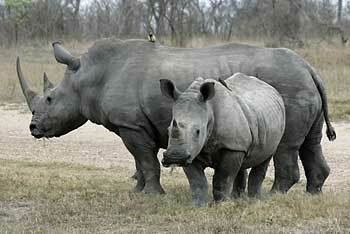 The white rhino is generally not very aggressive and has a much more tolerant nature then the black rhino. Rhinos in general have very poor eyesight, and depend heavily on their acute sense of smell and hearing to recognise potential danger. Baby white rhino standing in long grass Reproduction: The white rhino cow can give birth any time of the year after a 480-day (16 months) gestation period. Rhino calves can weigh up to 40kg (88lbs). The cow moves away from the group (or "crash") of rhino to give birth, and remains away for several days after. The white rhino calf walks in front of its mother, in contrast to the black rhino, where the calf walks behind the mother. The white rhino, using its square lips, grazes up to 30 different species of short grass, and requires a reliable source of water. Rhinos have a wide range of different vocalisations. They huff when they are surprised, and the calves are known to squeal. Shrieking is a sign of submissiveness, while snorting and snarling is a sign of agression aimed at repelling intruders. 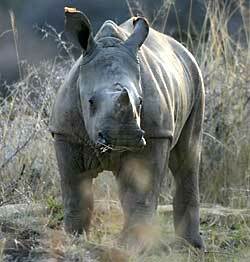 For additional information about white rhino, see our gallery of Rhino Pictures. Return to Wildlife Info .